This book is receiving great acclaim and I can see why. Divided into three parts, with alternating character chapters, you are provided with great insight into each of the four main leads and how their lives are entwined. With everything from an AFL (Australian Rules Football) Grand Final to asylum seekers - this book truly has it all. At its heart this is a book that puts a microscope on contemporary Australian living with its honest portrayal of not only multiculturalism, but also drawing attention to the ugly side of social media. Tess Woods gives honest accounts on diversity, prejudice and religion - so very topical and handled so well. Her serious exploration of contemporary issues are not only wide ranging, but heartfelt and compassionate. Woods shines the light on everything from the plight of asylum seekers, privacy issues in this digital ‘tell all’ age, cross cultural relationships, religious bigotry and the debilitation of depression on all those who come in contact with it. Yes, this is also a tale of two love stories, but Woods definitely strikes a balance between that and the social spotlight investigation. In keeping with the social realist approach, the love here is real with its ‘warts and all’ approach covering not only the joy and passion, but also the loss and heartache. The array of supporting characters, the detail provided to their stories, is also demonstrative of how each has a role to play, adding real depth and support to each of the many themes. The title could not be more apt - this is a book where the central theme is about finding your way in life, navigating as best you can because it’s not always smooth - it’s messy! Complex! But also, it can be very beautiful! This is a powerful and thought provoking book with its contemporary focus on the messiness of life and having strength of character to stay the course, grow and develop despite what others may claim. 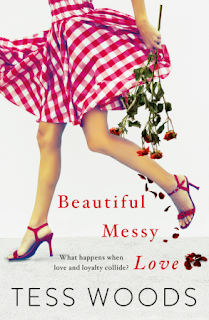 It’s beautiful, it’s messy, it’s love. The love I had for the people who surrounded me and the way I loved those I had lost was messy –it was complicated, difficult and sometimes unbearably painful. But that didn’t make it any less beautiful.